(Green Bay, WI) – Join 15,000 of your closest friends at Titletown Brewing as we prepare for the Wisconsin vs. LSU game! This event is open to the public and FREE! No advance tickets needed. 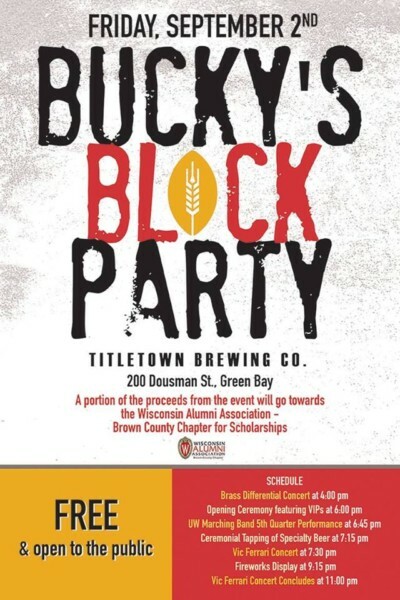 Come on down to the Titletown Brewing Co. campus for Bucky’s Block Party as we kick off the game with some Wisconsin pride! – Brass Differential Concert at 4:00 p.m.
– Opening Ceremony featuring VIPs at 6:00 p.m.
– UW Marching Band 5th Quarter Performance at 6:45 p.m.
– Ceremonial Tapping of Specialty Beer at 7:15 p.m.
– Vic Ferrari Concert at 7:30 p.m.
– FIreworks Display at 9:15 p.m.
– Vic Ferrari Concert Concludes at 11:00 p.m. Parking is available in the surrounding areas of Titletown Brewing Co. Plan to walk! No parking will be allowed on campus. All attendees who are 21+ will be carded and wristbanded. Food & beer will be available for purchase. A portion of all proceeds will be donated to Wisconsin Alumni Association (WAA) – Brown County Chapter for scholarships.